How can I refund prepaid tickets? Prepaid tickets can be refunded from within Doorkeeper by the event organizer. Refunds are possible within 60 days of the ticket purchase. Click "Refund" and then click "Cancel registration" to also cancel the participation. When doing a partial refund to a participant, the organizer can decide the amount of money to refund. By doing this, Doorkeeper's transaction fee will not be refunded. Click the transaction id. When you see the "Payments" in Stripe, click "Refund Payment"
The entire amount a participant paid (including Doorkeeper and PayPal transaction fees) can be refunded to a participant. However, a PayPal refund fee may apply (a ¥40 fee applies in Japan). This fee will be deducted from the organizer's PayPal account. Before full refunds can be issued, the organizer's PayPal account needs to be setup to process refunds. Click "Refund & Cancel" and then "Cancel this registration" to complete the refund. 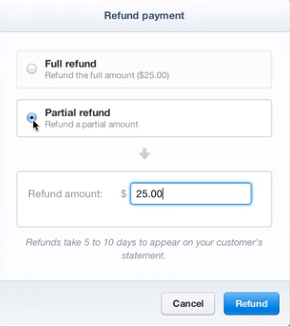 Click "View transaction details on PayPal"
Click "Issue a refund" and follow the instructions to complete the refund. From Doorkeeper, click "Cancel registration" to also cancel the participation.